Tempe Pawn and Gold is the #1 estate jewelry buyer in Tempe, Mesa, Scottsdale, AND Chandler! As an estate jewelry buyer in Tempe, we come across many incidents involving the difference between Estate and Antique jewelry. Estate jewelry is another name for “used jewelry.” Many people commonly refer to estate jewelry as antique jewelry, vintage jewelry, and period jewelry. It is very common for estate jewelry to not have a receipt or any documentation verifying where it came from. This makes it very important to bring your pieces to Tempe Pawn and Gold so our well trained staff can correctly appraise and authenticate your jewelry, gold, and diamonds. Estate jewelry can date back as far as the early Victorian era (1837-1855) and can be more recent, such as the Retro jewelry era (1945-1960). A lot of people confuse estate jewelry with antique jewelry. Estate jewelry is just a pre-owned piece, but antique jewelry has to be at least 100 years old to be classified as antique jewelry. Although antique jewelry may be estate jewelry, estate jewelry is not always necessarily antique jewelry. With over 30 years of extensive knowledge in Tempe, Scottsdale, Mesa, and Chandler within the jewelry and diamond industry as an estate jewelry buyer, our pawn has the experience , to know what your jewelry is worth. We offer free appraisals on your estate jewelry and we are able to turn your estate jewelry into cash within minutes. Don’t let these valuable items sit in your drawer and collect dust any longer – turn them into cash in Tempe! 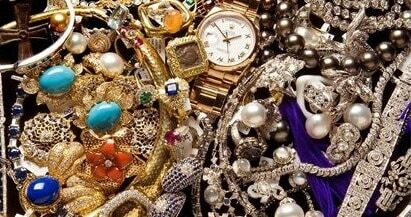 Estate jewelry should always be your first choice when attempting to scrape together some fast cash. It’s because of what the whole definition of estate jewelry is: typically old, antique, or older jewelry that’s just sitting around. Rather than being forced to sell essentials that we need in our daily lives, like electronics, cell phones, laptops, or televisions, estate jewelry that’s just collecting dust can be the most efficient way to put that cash together. Whether it’s gold or silver estate jewelry, it makes all the difference at the end of the day and when you go home with that cold, hard cash in your hand, you’ll never even notice that you emptied out that little drawer full of jewelry. There’s no other pawn shop you should be trusting in the Tempe, Phoenix, or Scottsdale area to treat your silver and gold jewelry fair, while truly helping you out of your financial situation. What Estate Jewelry do we Buy and Sell? We buy and sell all estate jewelry including: diamonds, watches, bracelets, rings, necklaces, earrings, pendants, designer jewelry, gold, silver, and platinum. We are always getting new items in our inventory, so stop in and take a look at our selection located in Tempe, also serving Scottsdale, Mesa, and Chandler. Understand that the value in estate jewelry doesn’t come from its antiquity or how vintage it is, it comes from the precious metal that is stored inside most of the time. This means that your diamond, silver, or gold estate jewelry is always valuable and as the premier jewelry pawn shop we will be your estate jewelry buyer. This means that all types of estate jewelry is as good as cash at Tempe Pawn and Gold, no matter if you’re in Tempe, Phoenix, or Mesa. How this works is via the gram weight of the precious metal that is stored inside giving it value. While we do evaluate estate jewelry on a piece by piece basis(some pieces can have more value due to its unique nature, however it is not often), most will find its value when we’re your estate jewelry buyer due to the silver, gold, or diamond content stored within. Don’t forget we also serve Scottsdale, Mesa, and Chandler.